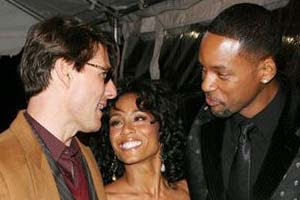 Tom Cruise and Will Smith share a deep bond. Real deep. It’s a beautiful thing! Sunday night he was in Sin City supporting his good friends the Beckham's at the Spice Girls Reunion Tour, Monday Cruise show up to the ceremony where Smith immortalized his hands at Grauman’s Chinese Theater in Hollywood, then on Tuesday Tom flew cross-country to support Will Smith's movie "I Am Legend". It's good to see these two together again after what appeared to be a fracture in their friendship. What happened you ask, well last year TC was supposed to show up at the Moving Image Awards and support his friend Will Smith, but Tom was a no show because maybe Will was defending Tom when the poor guy was being thrown under the bus by just about everyone. Then this year Tom was honored, I remember asking someone if they thought Will Smith would show up, and they said he wouldn't and went through the story. A few weeks back Will Smith went to bat for Tom Cruise and the interviewed appeared in print, in the media all over the entertainment news. Smith admits in the issue of Men’s Vogue on sale Tuesday that he has studied Scientology with Tom Cruise and doesn’t disagree with its basic tenets. Will Smith says Scientology teachings are 98% identical to Bible and so here we have it, Tom Cruise will be covering his friends back for now on. Last week the Beckhams were on Barbara Walter's Most Fascinating People of 2007 show, and on Monday they were on Larry King. Both shows asked about Tom and Scientology, and on both occassions the Beckhams supported Tom Cruise, Katie Cash Holmes and Scientology stating the Cruises' are a nice family, and they have never pushed their religion on them. (I am not saying I think TC is wrong in his religion, or right, but what I am saying is Tom Cruise is a loyal friend when you are loyal to him) (Photo credit: 1st shot - WENN, 2nd shot Hughe Dillon) - On Page SIX today: Sightings TOM Cruise and Katie Holmes with Victoria and David Beckham being escorted through the back door of SW Steakhouse at Wynn Las Vegas after closing on Sunday night for stone crabs and Kobe steaks. proof of the widespread issue, but they just shrugged it off. As expected, the models of consoles offered include the Xbox 360, the Sony Playstation 3, and the Nintendo Wii. and a all round enjoyable blog (I also love the theme/design), I don't have time to look over it all at the moment but I have saved it and also included your RSS feeds, so when I have time I will be back to read a great deal more, Please do keep up the excellent work. high definition televisions, Blu-ray Disc players and Logitech's Revue. The built-in web browser of Google TV separates it from media streaming devices like apple tv. In this day and age it is impossible to stay on top of all the latest pieces of technology. Fine way of describing, and pleasant paragraph to obtain facts concerning my presentation topic, which i am going to deliver in academy. Simply click on the program that you want to watch and go directly to the channel it's playing on. All 3 of the devices take care of high-definition streaming video, although the XD is the most reasonably priced with 1080p capability. However, Play - On does allow developers to make custom channels that you can load onto your server. Wow, that's what I was seeking for, what a data! present here at this webpage, thanks admin of this site. You're so awesome! I don't think I've read through a single thing like that before. So nice to discover someone with a few original thoughts on this subject matter. Seriously.. thank you for starting this up. This site is one thing that's needed on the web, someone with a bit of originality! web site and now this time I am visiting this web site and reading very informative articles here.